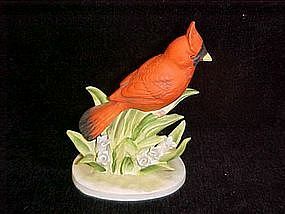 Large Lefton cardinal figurine with blue Lefton stamp and red & gold foil sticker. #KW 465. Measures 5 3/4" tall. Hand painted with nice detailing. Great condition, but I noticed there are two small petals from the flowers that have been chipped. Look at photo closely. A great addition to your bird figurines.